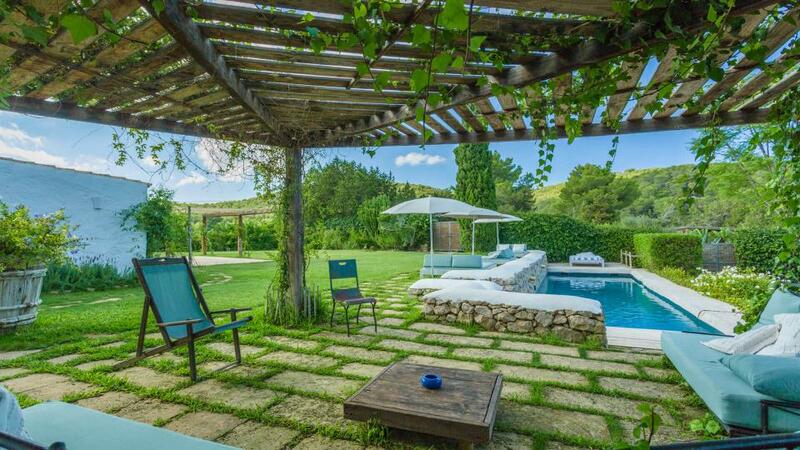 Villa restored and located in the countryside, near the village of San Carlos, in the valley of Morna. Ideal house for families. Room, Ground level. This bedroom has 2 single beds 90 cm. Bathroom outside the room, private, With shower. This bedroom includes also TV, safe. Room, Ground level. This bedroom has 2 single beds 90 cm. Bathroom outside the room, shared, With shower. Room, 1st floor. This bedroom has 1 double bed 160 cm. Bathroom outside the room, shared, With bathtub. Room, 1st floor, direct access to the terrace. This bedroom has 1 double bed 160 cm. Bathroom outside the room, shared, With bathtub. The entrance to the house is through the dining room and plunges you into a pleasant atmosphere. With its high ceilings, it is the oldest part of the house, which is more than 500 years old. Further, you will find another dining room with 3 very comfortable chairs and a fireplace. The kitchen is very well equipped with modern kitchenware. The laundry room with washing machine and dryer is also available in the house. 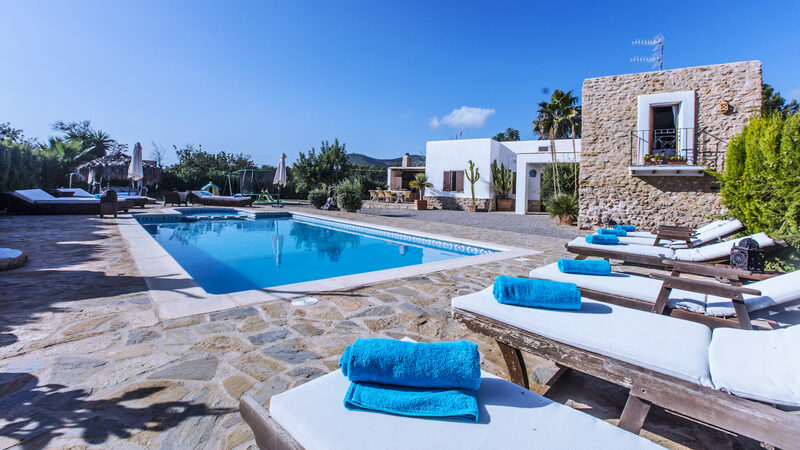 The villa has an outdoor kitchen with a large barbecue, close to the pool, making it the perfect spot for sunny meals with family or friends. A large wooden table can accommodate up to 10 people. The private rectangular pool (9m x 5m) will be there to refresh you, and children will enjoy the space dedicated to them with their small pool, a trampoline and swings. On the terrace, guests can enjoy sunbeds and a Balinese bed in the garden, and if the pool does not relax enough, you will enjoy a relaxing bath in the jacuzzi. 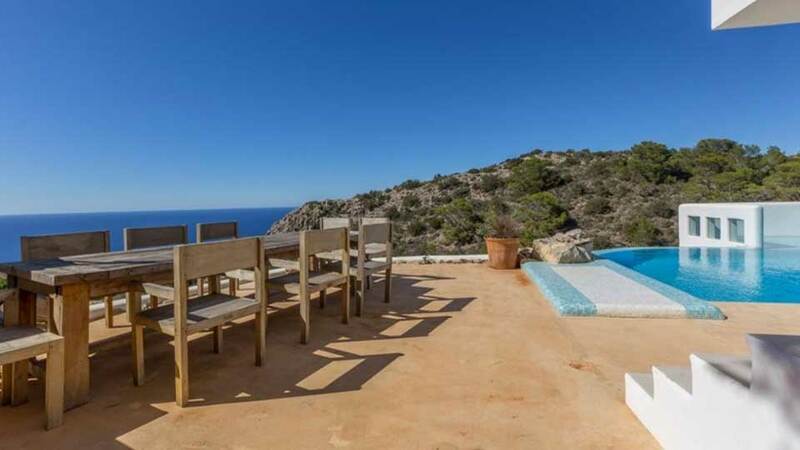 The villa is located in the north of the island of Ibiza, near the village of San Carlos. The villa has been restored with high quality materials while keeping the details of its basic structure. 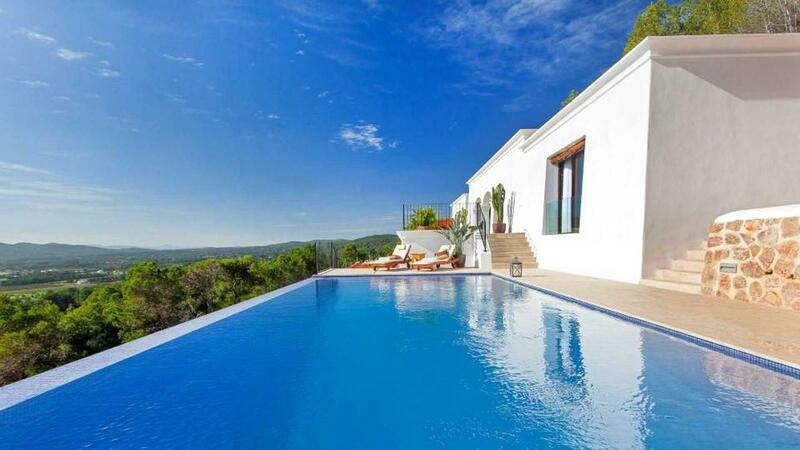 This villa can be rented with another adjoining house of 7 double rooms for large groups that would need 24 places. There are a lot of little paths around the house for those who wish to take short walks in the countryside. The house is surrounded by fruit trees, gardens and fields with horses and goats. 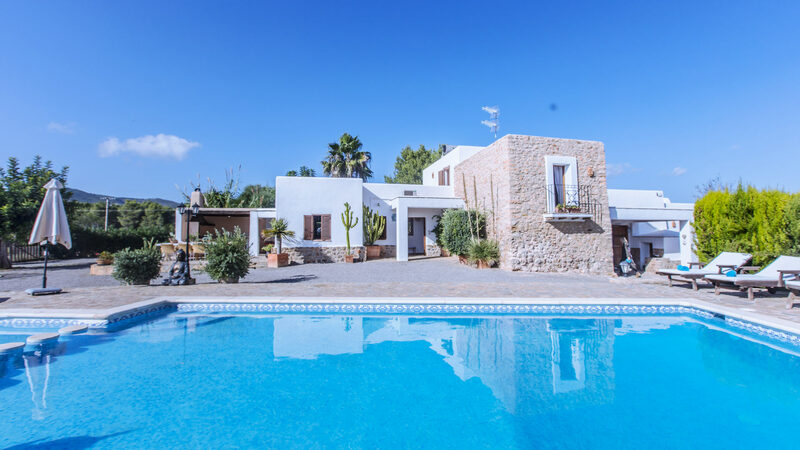 The house is very comfortable and offers an experience in the countryside although close to beaches such as Aguas Blancas and Cala Nova located in the north-east coast, just 10 minutes by car. The Hippy Market in Las Dalias and the village of San Carlos are 5 minutes from the house. A farm is located near the house, where you can buy organic fruits and vegetables.